Next up on our Song-By-Song preview is the official entry from Ukraine, “Under The Ladder” by Melovin, written by Mike Ryals and Kostyantyn Bocharov. The song is performed in English. 20-year-old Melovin came to prominence as the winner of “X Factor Ukraine” during its sixth season. The song has been selected to get one of the cushy spots overall, and will be performed 18th and last in the competition order on the second semi-final on May 10. The song performed last on each semi-final is usually (but NOT always) assured a spot in the Grand Finals. Next up on our Song-By-Song preview is the official entry from the Czech Republic (also sometimes referred to as Czechia), “Lie To Me” by Mikolas Josef, written by the artist. The song is performed in English. He has been involved in a music career from a very early age and is already an accomplished singer, songwriter, director, and choreographer. 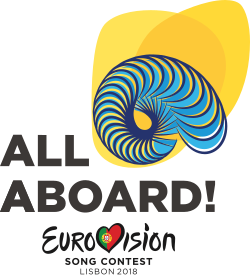 The song will be performed 5th in the competition order on the first semi-final on May 8. I hope everyone isn’t angry about missing the last entry on Friday and all day Saturday; I decided to go dark on EuroVision matters for 24 hours after the sudden and tragic passing of Avicii; as I said in my tribute post on Friday, I was a huge fan and he will be deeply missed by myself and all of his millions of fans. Now, it’s time to get back to business. Next up on our Song-By-Song preview is the official entry from Moldova, “My Lucky Day” by DoReDos, written by Phillipp Kirkorov (music) and John Ballard (Lyrics). The band is from the city of Ribnita, and have been together for several years, made up of Marina Djundiet, Eugeniu Andrianov, and Sergiu Mîța. They have tried to represent Moldova twice before, but this is the first year they’ve been selected to do so. The song will be performed 7th in the competition order on the second semi-final on May 10. Next up on our Song-By-Song preview is the official entry from Australia, “We Got Love” by Jessica Mauboy, written by Anthony Egizii, David Musumeci, and Jessica Mauboy. The song is performed in English. Mauboy is a favorite in her native Australia; she was the runner up of the 2006 edition Australian Idol, and hasn’t looked back since, becoming one of the country’s most succesful female artists. The song will be performed 9th in the competition order on the second semi-final on May 10. Now, those of you who are not familiar with EuroVision are probably asking the question, “Australia? Exactly HOW are they considered European? How the hell did they get into EuroVision?” Well, as a reward for carrying the contest for years down under, the European Broadcast Union, who runs Eurovision, asked Australia to participate for the 60th anniversary show in 2015. Their showing in the contest thus far has secured them an invite every year since. So although technically NOT a member of the EBU, which is normally a requirement for participation, they HAVE been doing extremely well since debuting, landing top ten finishes each of the three years it’s participated thus far – a fifth place showing for Guy Sebastian‘s “Tonight Again“, 2015; a damn near topper in runner up “The Sound Of Silence” by Dami Em, 2016 (which MAY have won had it not been for the craziness in Ukraine that year, which along with a great song like Jamala‘s haunting “1944″ helped to hand it a win; and why Ms. Em hasn’t broken in the US yet is mystifying to me – she is utterly STUNNING); and a ninth place showing for “Don’t Come Easy” by Isaiah in 2017. Personally, I doubt that 2018 will be their year – Dami Em’s runner up is going to be damn hard to beat in the future – but we’ll see…. Next up on our Song-By-Song preview is the official entry from Romania, “Goodbye” by The Humans, written by Alexandru Matei, Alin Neagoe, and Cristina Caramarcu . The song is performed in English. The band has been rocking their native country out of Bucharest for the past couple of years. The song will be performed 2nd in the competition order on the second semi-final on May 10. I have to say up front that I like this song. I’d like it better if I was presently living in the late 1980s or early 1990s. The song, while musically excellent, sounds stuck in a time warp – it’s reminiscent of songs from that era by female led groups like Heart or Vixen, with a slightly more modern vibe that stems from female-fronted bands like Evanescence and Halestorm. Problem is, there isn’t enough of the “now” vibe and too much of the “then’ vibe. Some rock stations go for this kind of sound here in the US, so it has a chance to make the Rock Tracks chart, but I can’t see it doing that well on the general Hot 100; I think too many people would be put off by a slow ballad that suddenly turns into a firestorm, like this song does. Romania made their debut in EuroVision in 1994, but due to various reasons, they have only participated 18 times. They have not been able to capture a Grand Final win as yet, but have finished as high as third place, which they have managed twice, in 2005 and 2010. Romania has also managed to make every final each year they’ve participated since the semi-final round was introduced in 2004. Many Eurovision fans thought that they might have a winner last year, with the fan favorite “Yodel It!” by Ilinca and Alex Florea, but alas, it wasn’t to be – it finished 7th overall. Next up on our Song-By-Song preview is the official entry from Latvia, “Funny Girl” by Laura Rizzotto, written by the artist. The song is performed in English. Rizzotto has been pursuing her musical career since her teenage years, and has had quite an education around the world,. Born of Latvian and Brazilian descent, she has lived in Minnesota much of her life, and getting schooling at both Berklee College of Music in Boston and the California Institute of the Arts. The song will be performed 14th in the competition order on the second semi-final on May 10. Wow, this is one bitter song, and no surprise, it’s about a woman who’s discovered her man is cheating on her. It’s lyrically close to Dolly Parton’s classic “Jolene“, but with the fire and passion you usually find from a Lady Gaga or Beyonce, and the vocals are more in line with Celine Dion or Gloria Estefan. And the video looks like a well done Laurie Anderson performance. In other words, the song is all over the road…and strangely, it works…way better than I think it should. An US release deal could take this song to charts easily, as it fits with perfection the current contemporary radio sound. Next up on our Song-By-Song preview is the official entry from Albania, “Mall” by Eugent Bushpepa, written by Bushpepa as well. The song is performed in Albanian. Gent, as he’s also commonly known, has been rocking out and carrying the human rights banner in his native Albania and nearby Kosovo as well, where he is also hugely popular. He too has a connection to television talent shows, but for once it’s on the other side – he was one of the celebrity advisors on “The Voice of Albania” in 2017. The song will be performed 3rd in the competition order on the first semi-final on May 8. Another deeply heartfelt love song – the title translates to “Yearning” in English – and full of incredible emotion. The stark and heart-tugging black and white video, which accentuates the feelings of yearning through dance, helps bring this one home – it’s my favorite non-English song so far, and I’m not alone in that – the song has quite a large following, although it’s usually in the middle of the pack of most favorites videos on YouTube. Again, no song in Albanian has ever charted in America, and I doubt this would be the first…but I sure wish it would be, and perhaps an English version by the artist would help its chances here.